Running is a relatively egalitarian sport, with a very easy entry level. You don’t need to muster up a team of people, and you don’t need loads of expensive equipment to get started. When I first started running, I lived in mum’s hand-me-downs for literally everything, but if you’re not blessed with a bonkers-mother-runner like mine, here is my guide for the kit you’ll need. My flat. You can only actually wear ONE pair at a time. Start with one pair. Go and get your gait analysed at a running shop. You’ll run for a few strides on a treadmill, and they’ll take some slow-motion video and see how your foot falls. Based on this they’ll recommend several pairs of shoes based on your foot strike and you’ll try the treadmill with them. They even had me running with two different types of shoe – one on each foot at one point! You don’t have to buy the most expensive of the ones they suggest, just whichever feels right to you. As a plus, when you’ve just dropped a bunch of cash on a new pair of running shoes, you’re going to be more inclined to go out running to get your money’s worth. Motivation comes in lots of forms. If you’re a lady, you’re going to need a sports bra, even if you’re not that large in the chest. A proper sports bra. They’re a real pain to try on, so go to a sports shop on a day when you’ve got plenty of time, are not feeling ragged and it’s not too warm. Try a good few on and don’t forget ‘The Bounce Test” – give it a good jump in front of the mirror and make sure everything’s staying put. I have had success with both Nike and Adidas bras, and lots of people speak highly of Shock Absorbers, but try lots and see what works for you. Clothes-wise there are two schools of thought: 1) Just wear what you have at hand. At first you’re probably not going to be out for hours and hours, nor will you work up too much of a sweat. So, ultra-wicking fabrics and seamless tech tops aren’t really necessary at this point. Clothes-wise, jogging bottoms (the clue is in the name) and that t-shirt will be fine. The one from that band that you saw, the t-shirt that’s not quite nice enough to wear out normally but still a bit too good to be a sleep t-shirt. That one will do. or, 2) Any excuse for a new outfit! A commenter on my last “Getting Started Running” post recommends getting new gear – “Don’t skimp on running clothing. It’ll be more comfortable while making you look and feel like a serious runner. If I ever lack motivation I like to go out and buy myself a new shirt and I’ll have to go on a run to show it off!” I still don’t like spending lots of money on sports gear (Getting it free from mum for so long spoiled me! ), so here are my picks for styley pieces at reasonable prices. So there you have it, my running kit guide for beginners – some trainers, possibly a bra, and don’t be naked on your body. What kit would you recommend for new runners? What could you not live without? I always think of clothing as a good investment though, if you buy decent brands it’ll last well. I’m wearing one pair of shorts still that are 6 or 7 years old. Field and trek or MandMdirect are my 2 go to places for shopping online, both sell prior season stuff and always good value. Prior season is such a good tip! The trends don’t come and go so fast to make any difference. I got my last pair of trainers with 20% off for being last seasons when they’re equally ugly as this season’s. I’ll check out those two shops. I believe neon makes me go faster, so my shoes and clothes are as gaudy as possible! TK Maxx has good sports clothing. There’s a brand called MPG which is yummy. Ooh, thank you for the tip on TK Maxx. I get my ski wear there but hadn’t really thought of running stuff. And YES, bright colours definitely make you zip faster! Bah, I think it says it all about my priorities when I was more interested in the cook book collection than the running shoes. Never been one for specialist running kit as I’ve never found a difference in performance with one exception. Go out and get proper running socks. I’ve noticed a world of difference to both comfort and the smell of my running shoes after. 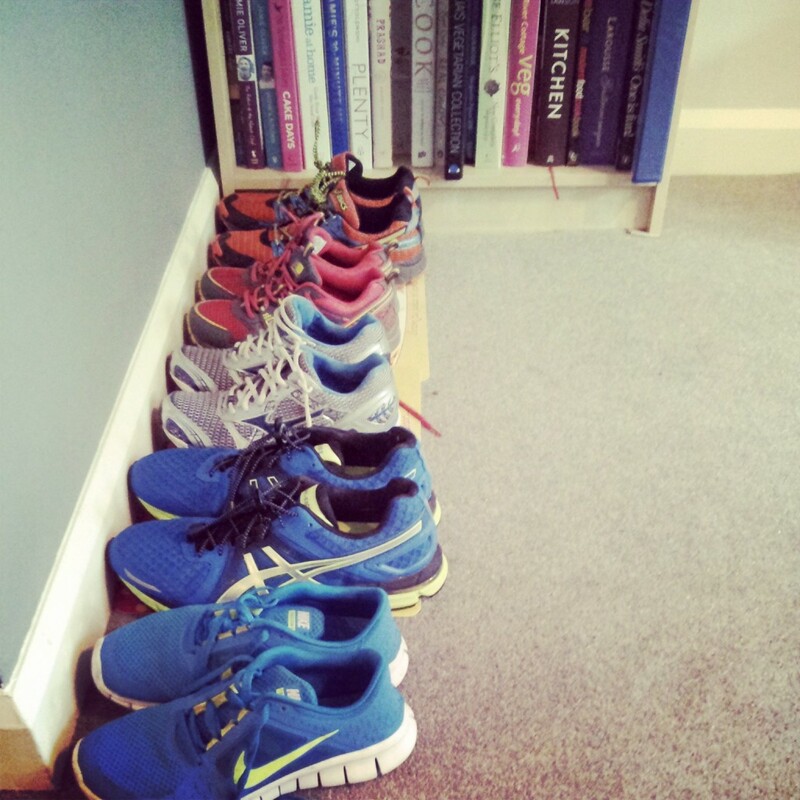 Haha that’s my house all over – hundreds of running shoes and recipe books! Do you have any of the ones in the picture? I have Plenty, Rover Cottage Veg, Delia’s Vegetarian Collection from the ones I can make out. They, along with Veggiestan are probably my favourites. Running socks can get expensive for very good ones but even a half decent pair make such a difference. I personally value the socks above running shoes because I’ve never had a problem with shoes no matter which pair I’ve used. 100% agree. Almost every runner will tell you that shoes are the most important part of running gear. That’s a given. But too many people neglect the vital role of the humble water-wicking socks, since even the best shoes are useless with cotton socks that rub and cause blisters. Shoes: yes. Get analysed. Clothes: there’s always a sale somewhere or other. I just got a great top from H&M. it’s part of their rather small fitness range, not all H&Ms stock it, but 7.99 for a “technical” vest THAT’S NOT PINK is OK with me. So very tired of pink! Otherwise I heartily endorse Sportspursuit though it does get addictive. I agree on socks: I swear by Karrimor from Sports Direct, £3.99 for two pairs. They are brilliant. I think I am betraying my kit addiction. There does seem to be a hint of kit addiction in there. Well worth it though, there are clearly worse things! I needed that tip on sports socks. I’ve been using Hilly Twin Skins for a while now, but at £12 a pair, it breaks you as a person when you lose one…! I’ll try Karrimor, thank you. If the perfect pair of running shoes is #1 on your list, the humble running sock is a close #2. THe best advice I ever got was to buy my running socks first and wear them when I’m trying on running shoes! The slightest difference in thickness of the sock can cause majors changes in the fit of the shoe. I always think of running socks as much of a muchness, but actually nowadays with ones with tight bits and ones with padded bits, they probably make a huge difference to the fit of your shoes. Something to bear in mind when I next splash out on some shoes! Ha, my other half was looking over my shoulder as I looked at this post and said ‘don’t you dare! you don’t need anymore running kit!’ as he saw the photo of all your trainers haha. I love treating myself to running kit, it makes me more excited to get out there. When I first started though all my running kit was black and the cheapest I could find from Sports Direct. I still get stuff from there because there are some bargains to be had but I’m a bit more adventurous and willing to spend a bit more as I know I’ll get my moneys worth. I can definitely tell the difference in quality between karrimor leggings and nike or adidas ones. Aldi also occassionally have running stuff in and their socks are pretty decent! I can’t believe what I’m hearing about Aldi, I’m so excited! Between this and the wine pages saying that they have decent very cheap wine, I may never leave the place. And, to your husband, what if you go on one run and your shoes get wet and then you don’t have any that go with your new non-black outfits? You probably need just one more pair… then another.